SBI or State Bank of India, the country’s largest bank, charges its customers a fee for money transfers. The charges for making fund transfer via NEFT (National Electronic Funds Transfer), RTGS (Real-Time Gross Settlement) or IMPS (Immediate Payment Service) mode vary, depending on parameters such as amount of transaction and timing of transaction, according to its website – sbi.co.in. NEFT and RTGS are electronic payment systems, which allow fund transfer between two accounts of different banks in the country. IMPS is a money transfer service that can be carried out though mobile phones or internet banking. The IMPS service helps to transfer money to the beneficiary’s account immediately when a fund transfer request is made through mobile phone or internet banking. The IMPS service is available 24×7, including holidays. SBI offers IMPS or immediate payment service transactions up to Rs. 1,000 without any additional charges. This was said by SBI on its website – onlinesbi.com. IMPS is a mode of electronic money transfer from one account to another across banks on an immediate basis. Effective October 15, 2017, SBI lowered its service charges on IMPS transactions by up to 80 per cent, State Bank of India further said on its website. 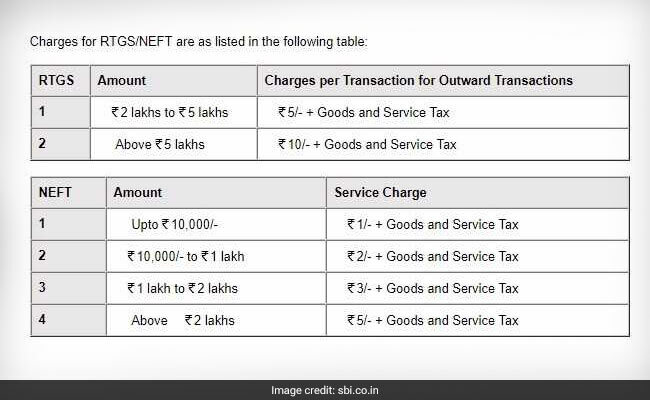 SBI has divided the charges applicable on IMPS transactions in four slabs. While IMPS transactions up to Rs. 1,000 don’t attract any charges as per the bank’s revised rules, IMPS transactions from Rs. 1,001 to Rs. 10,000 attract a charge of Rs. 1 plus taxes, according to SBI. Making a fund transfer from Rs. 10,001 to Rs. 1,00,000 via IMPS attracts a charge of Rs. 2 per transaction, SBI noted on its website. Also, IMPS transfers from Rs. 1,00,001 to Rs. 2,00,000 attract a charge of Rs. 3 per transaction. SBI charges Re 1 plus GST per NEFT transaction of up to Rs. 10,000 made online, using the bank’s internet banking facility, according to SBI website onlinesbi.com. For an amount between Rs. 10,000 and Rs. 1 lakh, the bank charges Rs. 2 plus GST per transaction. For fund transfer of Rs. 1 lakh-Rs. 2 lakh via NEFT mode, the bank charges Rs. 3 plus GST per transaction. NEFT transactions above Rs. 2 lakh made online attract a charge of Rs. 5 plus GST, according to the SBI website. SBI charges its customers for making NEFT or National Electronic Funds Transfer transactions on the basis of amount. The banking behemoth has four ranges based on which it charges a fee of Rs. 2.5-Rs. 25 per transaction. SBI charges Rs. 5 plus GST for every RTGS transaction of Rs. 2 lakh to Rs. 5 lakh made online, using the bank’s internet banking facility, according to its website onlinesbi.com. For such RTGS transactions above Rs. 5 lakh, the bank charges Rs. 10 plus GST per transaction, it noted. SBI charges between Rs. 25 and Rs. 56 per transaction via RTGS or Real Time Gross Settlement mode, depending on the amount and time of transaction, according to its website. These include RTGS transactions within SBI as well as inter-bank transactions, it noted. For making RTGS transfers amounting to Rs. 2 lakh-Rs. 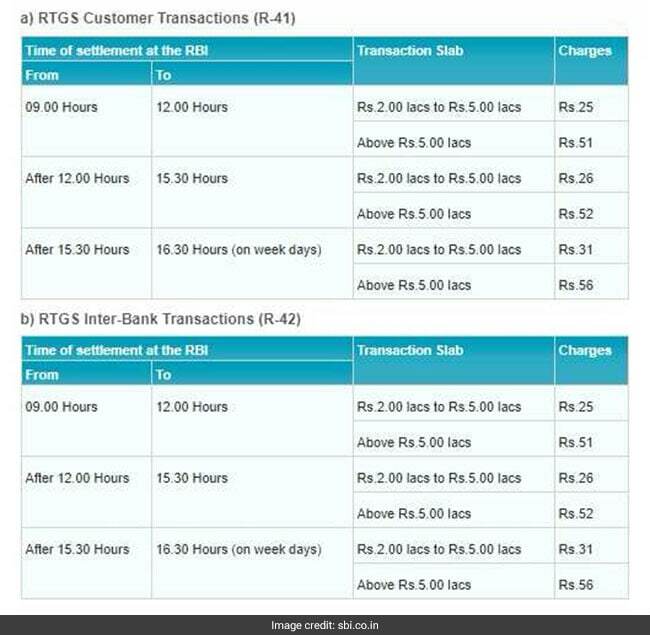 5 lakh between 9:00 am and 12:00 pm, SBI charges a fee of Rs. 25 per transaction, according to the SBI website sbi.co.in. For transactions above Rs. 5 lakh during the same hours, the bank charges Rs. 51 per transaction, it noted. During the time slab of 12:00 pm to 3:30 pm, SBI charges Rs. 26 for each RTGS transaction of Rs. 2 lakh-Rs. 5 lakh, according to the bank. Similarly, every RTGS transaction above Rs. 5 lakh during these hours costs Rs. 52, it added. For making RTGS transfers of Rs. 2 lakh-Rs. 5 lakh after 3:30 pm till 4:30 pm (on week days), the bank charges Rs. 31 per transaction, according to the SBI website. For transactions above Rs. 5 lakh during the same hours, the bank charges Rs. 56 per transaction, it noted.